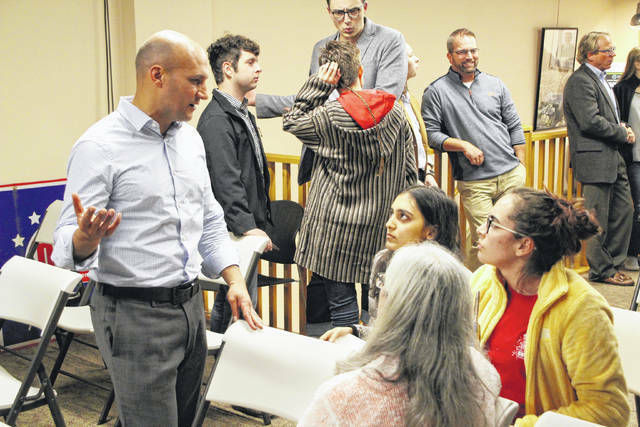 State Sen. Joe Schiavoni, left, talks with Ohio Wesleyan University students and Peg Watkins from the Delaware County Board of Elections following the Delaware County Young Democrats forum on Tuesday. Schiavoni, who is one of five Democrats running for Ohio governor in 2018, was the guest speaker for the event. Delaware County was a stop this week on the campaign trail for one of the five Democrats trying to become Ohio’s next governor. “As I travel the state, it’s reassuring when I see good crowds like this of people that are really excited about this election,” said State Sen. Joe Schiavoni, D-Boardman, the keynote speaker during a forum hosted by the Delaware County Young Democrats on Tuesday. It was the first in a series of events the group is sponsoring featuring statewide candidates. “This is what we need. This is how we’re gonna win. And it’s your job to pick who you think the best candidate is and then get behind them,” Schiavoni said. During his talk, Schiavoni addressed numerous issues that he has addressed during his ten years in the Ohio Senate, including charter school reform and expanded broadband internet access across the state. He’s calling for continued action to reform charter schools, specifically online schools, and has just proposed a “broadband for everybody” bill that would take access to many areas in Ohio that still don’t have broadband. Questions from the audience also covered a broad range of topics, from the crush of student loan debt to the opioid crisis that continues to grip Ohio and many other states. According to Schiavoni, the issue of student loan debt could be further resolved if Ohio invested more in higher education. When asked about his plan to address the opioid crisis, Schiavoni shared his idea to dip into the state’s Rainy Day Fund to provide necessary funding for education, treatment, and law enforcement. Schiavoni said being on the campaign trail has opened his eyes to many other issues facing Ohio, including poverty, infant mortality, failing infrastructure, and environmental problems. Schiavoni represents the 33rd Senate District, which includes Columbiana and Mahoning counties. He was appinted to fill a vacant seat in 2008, won election to a full term in 2010, and won reelection to the seat in 2014.
https://www.delgazette.com/wp-content/uploads/sites/40/2017/10/web1_DEL102617SCHIAVONI.jpgState Sen. Joe Schiavoni, left, talks with Ohio Wesleyan University students and Peg Watkins from the Delaware County Board of Elections following the Delaware County Young Democrats forum on Tuesday. Schiavoni, who is one of five Democrats running for Ohio governor in 2018, was the guest speaker for the event.